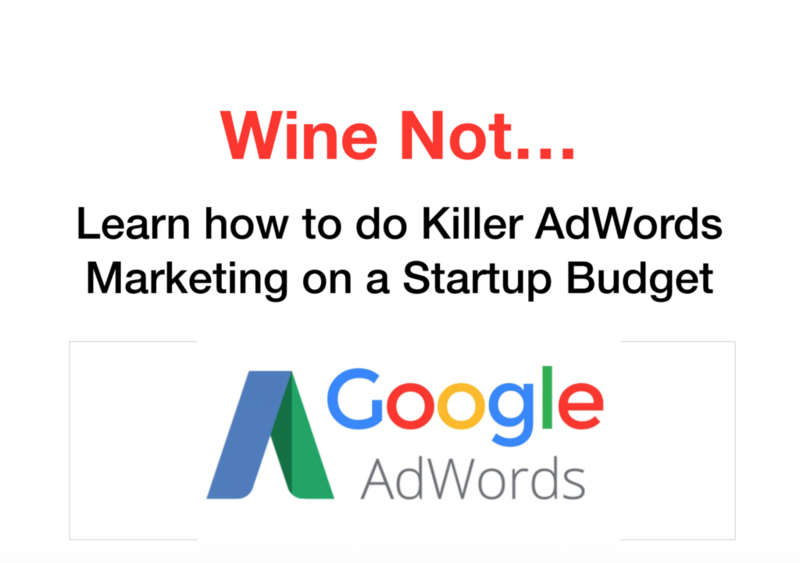 Todd Nevins, Founder of CLICKPlacement, hosted an event for startup founders in Austin TX where he taught the basics of setting up a Google AdWords marketing campaign that reaches the right audience with a relevant message and that results into a relevant prospect or customer. 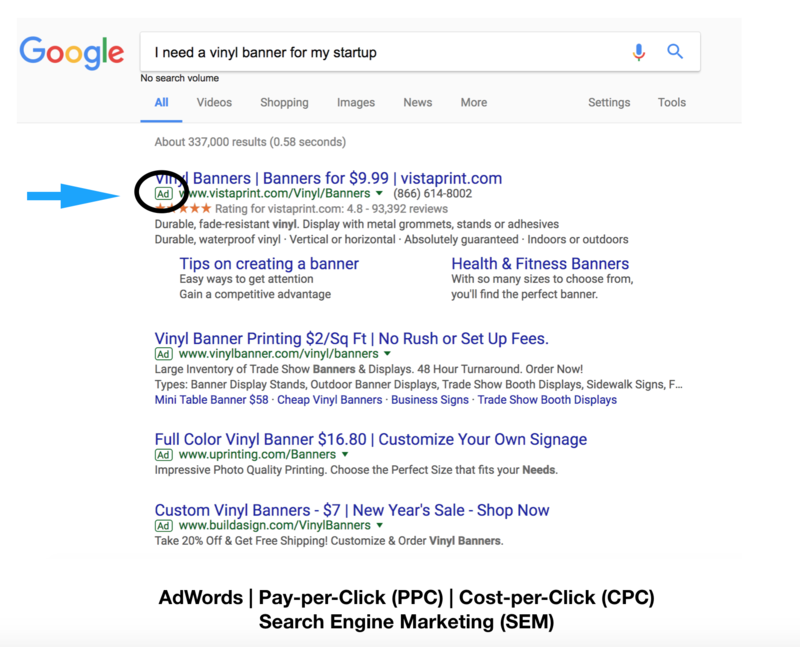 Google AdWords pay-per-click marketing ads are at the top of the search results and typically are 4 ads. This particular search result also show an AdWords Shopping Campaign on the right. Why all of the acronyms? Google AdWords Marketing, PPC Marketing, CPC Marketing, Search Engine Marketing (SEM). They all mean the same thing. Jump right to the video of the event where Todd Nevins dives deep into a local startup’s challenges when it came to setting up a campaign that delivered results and he builds a campaign on the fly for Galvanize, a data science bootcamp. The event featured an insurance startup headquartered in Austin, Lumen Insurance that has a unique challenge when it comes to ppc marketing. Lumen offers commercial insurance to emerging tech startups in Austin so they trying to REACH people that are searching for commercial insurance. Once we drilled into the most relevant audience that we wanted to reach, we asked the crucial questions. What words are my customers using to find me? 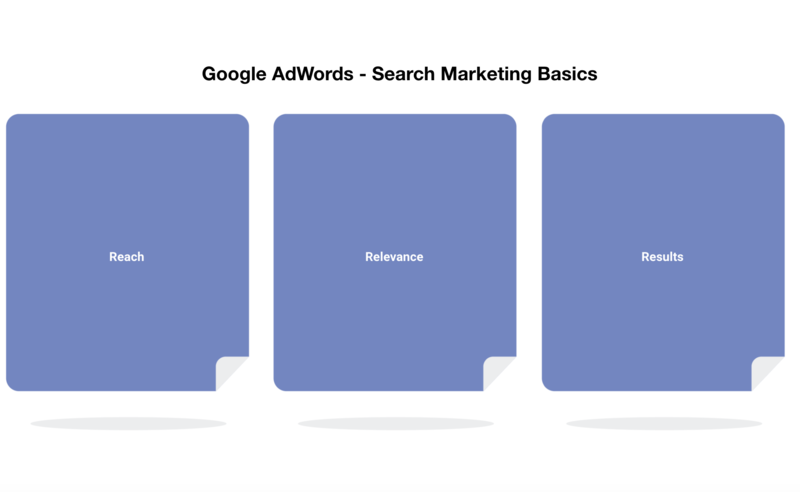 The AdWords marketing search campaign is keyword and search query driven so we had to make sure we were targeting the correct search queries and just as important, blocking out searches that are not relevant with negative keywords. 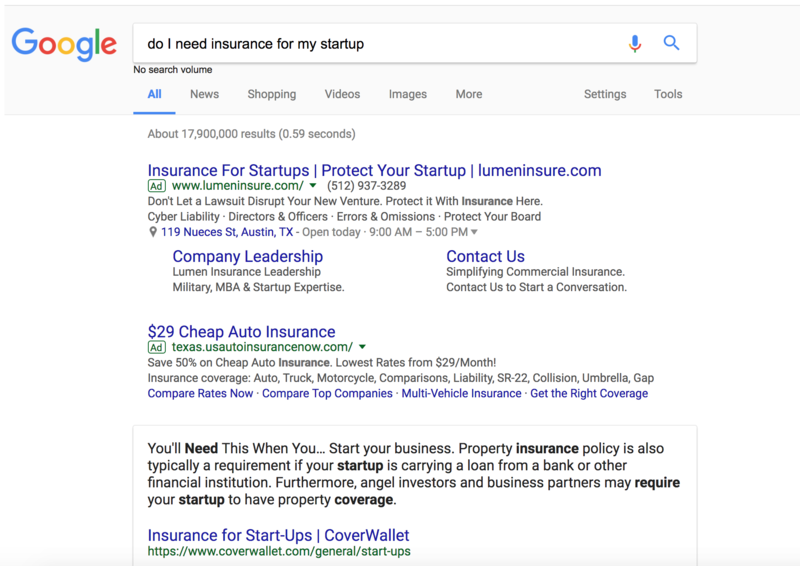 Since Lumen offers insurance to startups, their ads appear for these relevant searches but there is an issue on this search results page. The 2nd ad is selling Auto Insurance. Serving ads to an audience that is irrelevant is a major mistake and the company is wasting money every time someone clicks on their ad. To start your keyword research, think about Offense and Defense. Offense = the keywords that you are targeting. Defense = keywords that you want to block. 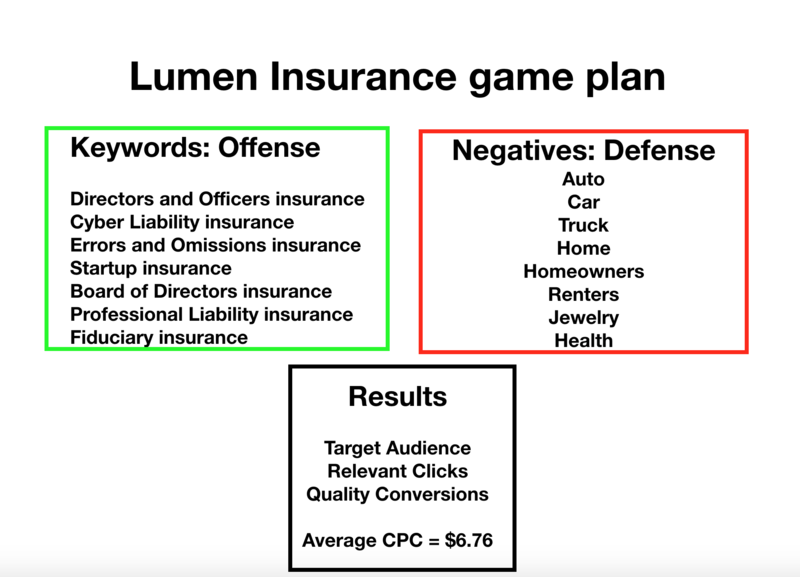 By using this strategy, Lumen was able to drop their PPC cost down from $20 to $6.76. Now that we are targeting the right audience and driving relevant clicks to the site that have the highest chance of converting, we begin to tweak the landing pages to boost our conversion rate. 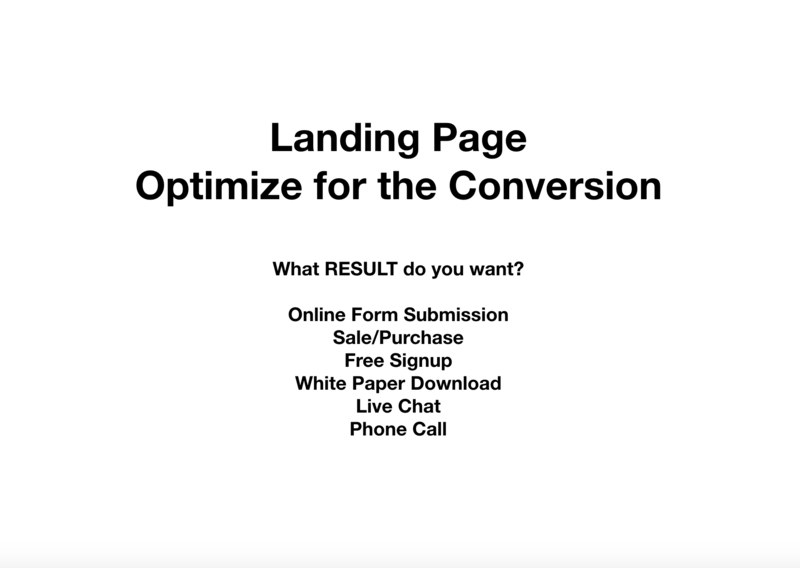 What do you want your visitors to do when they hit your landing page? Optimize your page around this action. 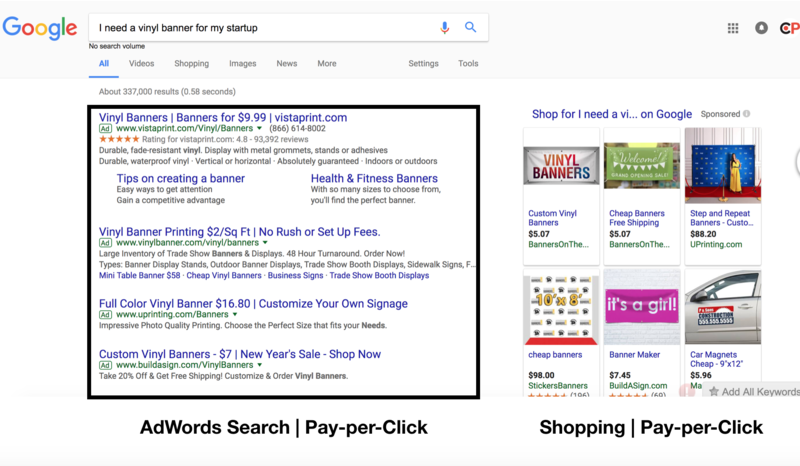 This was a look through a basic AdWords campaign designed for a company that targets a unique niche. The budget amount depends on your industry, the competition and the ROI you get from your visitors. I suggest setting a budget that you are comfortable with and run your campaign for 7 days. After 7 days you will have enough data to make the next right optimization decisions. If you’d like help setting up your campaign, setting your budget or a Free 2 Hour AdWords audit, contact CLICKPlacement today and lets start a conversation. 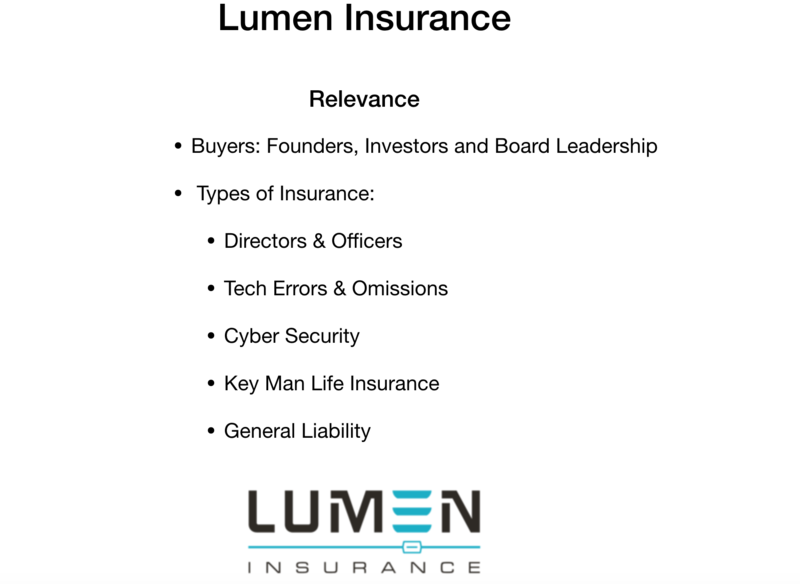 If you are in Austin, TX and need insurance for your startup, hit up Lumen Insurance. This entry was posted in Paid Search Marketing and tagged AdWords marketing, Google Adwords marketing, PPC Marketing.